In Stock: Will Ship Out In 1-2 Business Days. 20 Inch Sparklers - Ideal for Most Weddings! 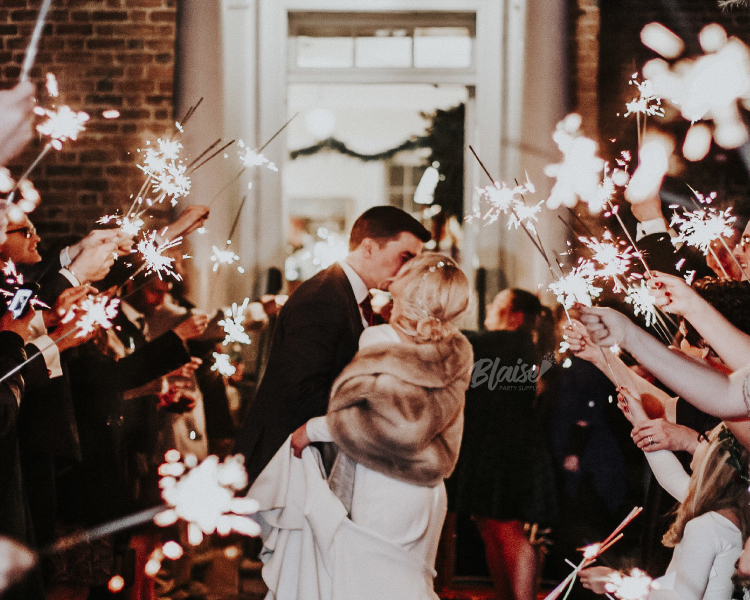 All of our 20 Inch Wedding Sparkler Packages include one wedding sparkler per person and each sparkler burns for approximately 1.5 to 2 minutes. 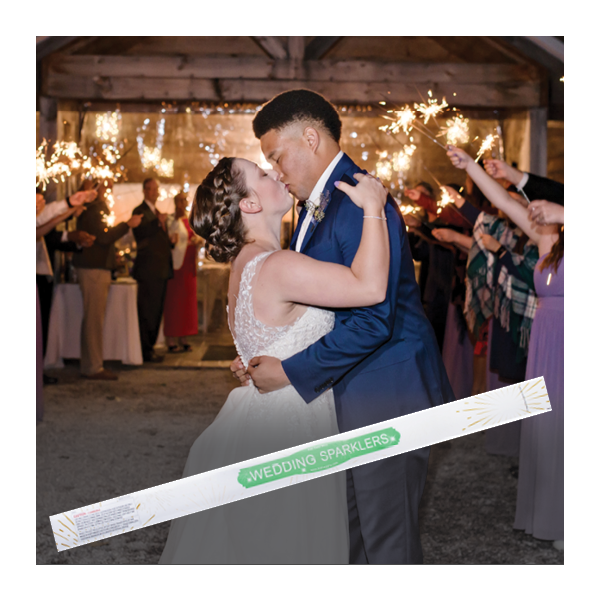 Before your sparkler send-off, our 20 inch sparklers can be a great addition to your wedding reception decor. 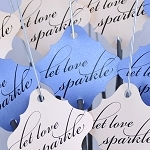 Display them in one of our wedding sparklers buckets, and for extra flair, attach one of our wedding sparkler tags to each sparkler! Our sparklers are produced with easy-light tips to make them easier to light. Also, as the best way to light a sparkler is with another lit sparkler, each sparkler order includes a free 6-pack of 10 inch sparklers to speed up the lighting process. We'll also provide easy lighting instructions and suggestions for an organized send-off. 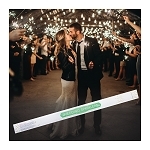 We suggest 20 inch wedding sparklers for weddings with 150 or fewer guests. 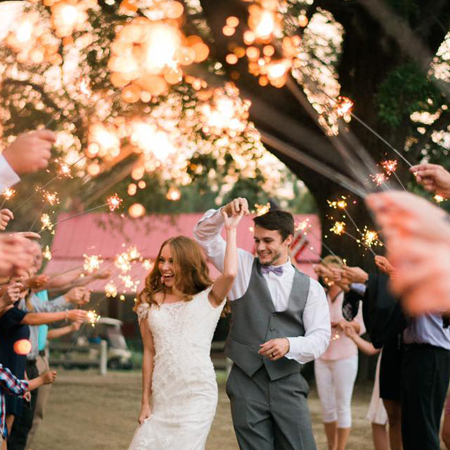 For larger weddings with more than 150 guests, consider ordering two sparklers per guest. Why Buy from Wedding Sparklers Outlet? 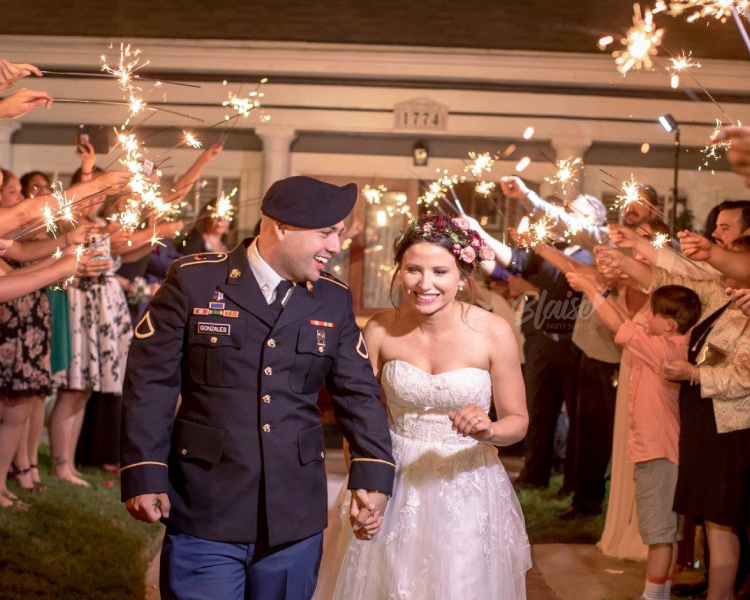 You can feel confident buying your wedding sparklers from Wedding Sparklers Outlet! You'll find many sparkler websites sell the same low-quality sparkler. We strive to provide a better quality and brighter sparkler produced specifically for weddings. We import our sparklers directly from the manufacturer which allows us to pass the savings on to you! Oh my AMAZINGNESS! We ordered the 150 person package, awesome quality, shipped extremely fast (didn't even pay for extra shipping even though i ordered them really close to the time frame! ), everyone loved them! Our favorite pictures are with the sparklers. Such a magical moment looking through them :) Worth every single penny. The sparklers worked perfectly. They all lit easily and stayed lit for the bride and groom's send off. They made the pictures more beautiful. I was a little scared about using the sparklers at first because I thought it may be a hazard having fire next to the bride and groom and a big wedding dress but it was no problem at all. I was worried for nothing; it made the exit so pretty. great sparklers! last longer then others. would buy again. This might have been the easiest decision and purchase for our wedding. We needed low cost but high impact and these were just the thing! They lasted the perfect amount of time for us to exit and even take a photo or two with our decorated car. I also planned my wedding in three months, so it was imperative that these came fast. The turnaround was fantastic! I would recommend these to anyone interested in sparklers. I also did a lot of research on price and this company was the cheapest I could find. I ordered these for my daughter's wedding after-party. They came in only two days (I did not pay for expedited shipping). The order was perfect and the sparklers were top-quality. You will not be disappointed. Worked beautifully without smoke. Thanks. For our wedding we decided at the last minute to order sparklers. 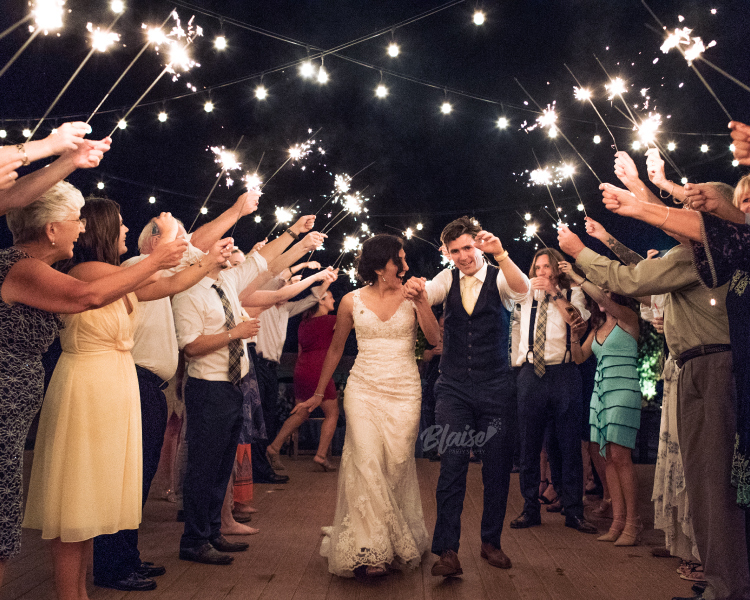 The sparklers added so much enjoyment and fun to our wedding. By far one of the best decisions we made! Wedding Sparklers Outlet delivered them quickly and the sparklers lasted the perfect amount of time. I am extremely happy with our purchase. Our guests loved it and we loved it! The sparklers looked very good on pictures. And they burned long enough for our exit. We used these sparklers for our wedding entrance and they were just as described!! We gave our bridal party 2 just in case it didn't last for the whole entrance 9 bridesmaids 9 groomsmen. I highly recommend and you can't beat the price! The 20" sparklers were perfect for our daughter's wedding send off. We were able to form a tunnel of light for the bride and groom to exit in. I would highly recommend them! Absolutely a must for a spectacular end to an amazing wedding!!! 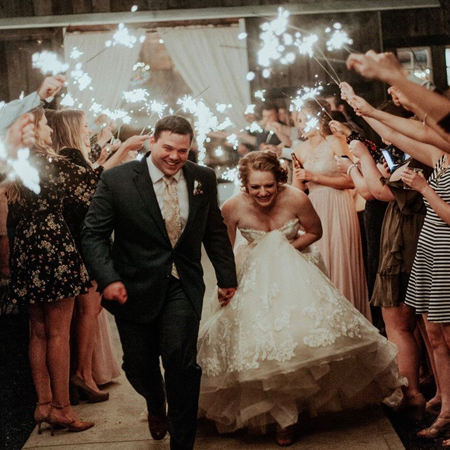 To walk down an aisle of sparklers just made our wedding night so much more special. To see all of our closest friends and family's faces in a sparkler display was more than I hoped for. So happy with this purchase!! Thank you!! Ordered 50 sparklers for my girlfriends surprise birthday party. Quite honestly they were the last thing I ordered and the first thing to arrive! No hassles, no nonsense- just an AMAZING product from an even more amazing company! The sparklers were the hit of the party! Thank you!! Sparklers lit easily, stayed bright, and led to great pictures! Just as described! I ordered the 20 inch sparklers and I received them right away!! Can't wait to use them at my Wedding!!! These sparklers were great! They came in the mail so quickly and were packaged well. This size was the perfect size to allow time for the sparklers to be lit and for my husband and I to walk around. I would definitely recommend them! We LOVED these sparklers! They were easy to light and so pretty! Can't wait to see all the pictures. Totally worth buying and the price is great too! They were awesome! No issues and lasted a really good amount of time!! Ordering these sparklers was very easy. This company is extremely customer friendly. I couldn't find a better price anywhere and the shipping was fast. The sparklers stayed lit for as long as we needed and looked great in our pictures. I will definitely use them in the future and recommend them.